Q. I’m divorced after 30 years following a church wedding. I’ve since remarried thru the Justice of the Peace. I DID NOT have my marriage annulled. Does that mean I’ve been living in sin all these 9 years? I still take Communion. Please advice. Thank you. A. Your question is not only one that affects many Catholics, it is also something that has been seriously discussed at length recently by our Church. In October, 2015, the Holy Father, Pope Francis, led an international Synod of Bishops and this was one of the questions they discussed at great length. First of all, it’s important to point out that the recent Synod on the Family took this question very seriously. In doing so, it reveals that our Church is deeply concerned about you and your situation and is diligently working on a pastoral plan that takes into account both our belief in the indissolubility of Marriage as well as the complex reality of many Catholics who are divorced and remarried outside of the Church. So, the first point is that this is a serious question that our Church is seriously aware of. With that said, it is important to point out that our faith professes what we call the “indissolubility of marriage.” Simply put, we believe that a valid marriage cannot be broken because it establishes a permanent spiritual bond. Therefore, if someone is validly married, gets divorced, and then is remarried civilly, our Church still recognizes the first marriage as the actual marriage. Or course this presents certain challenges for those who have divorced and remarried outside of the Church such as through the Justice of the Peace or in another Christian church. This is raises important questions for many, especially once the new civil marriage has been faithfully lived for several years (nine in your case). However, it’s important to note that the Church cannot ignore what we believe God established as indissoluble. So what is one to do? First, I strongly encourage you to look into the annulment process. An annulment is a way of presenting your first marriage to the Church so as to examine its validity. It’s not a Catholic divorce, rather, it’s a way of honestly examining the marriage from the beginning to discern whether something so essential to the marriage bond was missing that the marriage was never entered into validly from the beginning. Very often, when a divorce takes place, it becomes apparent that something was indeed missing from the beginning. So please do look into this process carefully with your parish priest. Even if an annulment is not right for you, it is important to look into it. Regarding your question about coming to receive Holy Communion, there is much to be said on this. 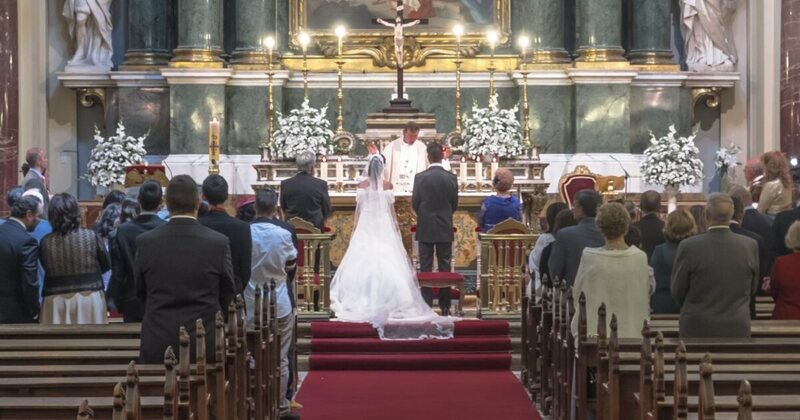 First, as a general norm, Communion should be refrained from when one is married outside the Church. You are still strongly encouraged to come to church, pray and grow in your faith, but Holy Communion is best refrained from at this point. But this is not the end of the discussion so do not stop reading yet. As I mentioned, the October, 2015 Synod on the Family addressed this question very thoroughly and directly. It pointed out clearly that those in your situation must be loved and welcomed with open arms by our Church. Therefore, it is important that you do come to church, practice your faith and grow in your love of God. Regarding Holy Communion, the best thing to do is to make an appointment with your parish priest or another priest you trust and sit down to discuss your entire situation with him. It’simportant to talk about what happened with your first marriage as well as your current civil marriage. Hopefully the priest will be compassionate and help you sort out what God wants of you. Again, the annulment process is something very important to consider. However, even without an annulment process the Synod did make reference to “internal forum” solutions. Though it is unclear what this means, it leaves the door open for the priest to prayerfully work with you to discern God’s will taking into consideration all the many complex factors that surround your current civil marriage and past divorce. In the end, the goal must be to seek God’s will and that must be done in collaboration with your parish priest. Now to your last question: “Does that mean I have been living in sin all these 9 years?” Personal guilt in sin is complex and is ultimately judged only by God. Therefore, the better question to ask is this: “How do I live God’s will for my life right now and in the future?” I suggest there are two things you need to do. First, look at what happened in the past. Examine carefully the reasons your first marriage failed. Be honest and open. Discuss it with your priest. Consider the annulment process since that process is often very healing and helps sort things out. And if you see any way in which you sinned, do not be afraid to admit to that. This depth of honesty is essential to a path of healing. Second, you need to ask God what He wants for you in your current civil marriage. Be open to all possibilities and seek only His will. Again, the Synod of the Family recognized that “one size does not fit all.” In other words, every situation is unique and requires special consideration and discernment. The best thing to tell you is to seek out the will of God honestly and continue to listen to Him. In the end, you will be held accountable before God based on the convictions of your conscience. So inform your conscience according to our Church teachings and faith, prayerfully enter into discernment, discuss it with your priest, and then make a decision as to how God wants you to live now and in the future. From there, know that the Lord is with you, has not abandoned you, and will continue to direct you to a life of holiness. are sometimes subjectively certain in conscience that their previous and irreparably destroyed marriage had never been valid.” (Familiaris Consortio, 84). It is therefore the task of pastors to accompany interested persons on the way of discernment in keeping with the teaching of the Church and the guidance of bishops. In this process it will be useful to make an examination of conscience through times of reflection and penitence. The divorced and remarried should ask themselves how they behaved toward their children when the conjugal union entered into crisis; if there were attempts at reconciliation; how is the situation with the abandoned partner; what consequences the new relationship has on the rest of the family and the community of the faithful; what example it offers to young people who must prepare for marriage. A sincere reflection can strengthen the trust in the mercy of God which is never denied to anyone. Note: The above is an unofficial translation. 4/8/2016 Update: The Holy Father, Pope Francis, issued a document on Marriage and the Family called AMORIS LAETITIA. This document is worth downloading and reading and offers much insight to the beauty of Marriage.